Here's what we all should learn from one of the worst stock market crashes in history. It's been 10 years since the collapse of Lehman Brothers, but for many Americans, the financial crisis and Great Recession seem much more recent. While the 2008-2009 stock market meltdown was certainly a stressful event, there are some valuable lessons that can be learned. So, whether you vividly remember the financial crisis or are too new to the world of investing to have experienced it firsthand, here are four valuable lessons that all investors can learn from this turbulent period that can serve as a guide for navigating tough economic times in the future. The S&P 500 index has generated annualized total returns of more than 10% over the past 30 years, but the average stock mutual fund investor has managed less than 4% over the same time period. One of the biggest reasons is that too many investors do the exact opposite of what they're supposed to during tough times -- they panic and sell their investments "before they go down any further." No matter how turbulent the market gets, panic is the wrong response. Image Source: Getty Images. In other words, it's common knowledge that the main goal of investing is to buy low and sell high, but during crashes like the financial crisis, many investors do the exact opposite. In fact, it's panic-selling that fuels massive market declines. During the financial crisis, it wasn't just individual investors -- institutional investors couldn't seem to sell their stocks fast enough as well. It may make sense to sell volatile investments such as stocks in turbulent times and put the money into "safer" places, but doing so can have a devastating effect on your long-term performance. In an October 2008 Bloomberg Businessweek article, Brian Gendreau of ING Investment Management said that "financial panics don't last forever...Either we're going to go into a Great Depression, or some of these assets are trading at very attractive prices." As Warren Buffett has said, "Opportunities come infrequently. When it rains gold, put out the bucket, not the thimble." This is why Buffett invested billions of dollars during and after the financial crisis in Goldman Sachs, Bank of America, and others. They were solid companies trading for fire-sale prices. When a crash comes along, take a deep breath and look at the situation as stocks being on sale. While it's a good idea to take advantage of corrections and crashes, that doesn't mean that you should stop investing when the market seems expensive. Timing the market is next to impossible and trying to do so often leads to missing out on gains. Here's the lesson: Over the long run, the stock market is an incredible creator of wealth regardless of when you get in. Consider this example. 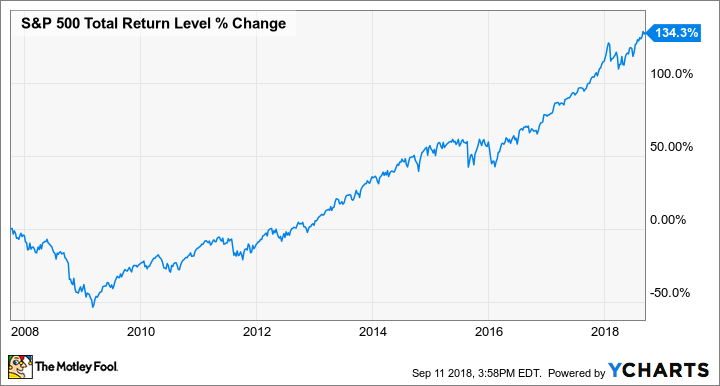 Let's say that you bought an S&P 500 index fund at the worst possible time before the financial crisis -- in October 2007, when the market was at its peak. Not only would you have recovered from your losses incurred during the crisis, but your investment would be up more than 134%. There will be another market crash in the future -- we just don't know when. There's no way to know at this point what sector, political event, or other catalyst will trigger it. The point is that when times get tough, no stock is bulletproof. Before the financial crisis, it would have seemed absurd for Lehman Brothers to declare bankruptcy, Bear Stearns shares to be bought out for pennies on the dollar, or for General Motors shareholders to be wiped out. Few people thought AIG, Citigroup, Fannie Mae, Freddie Mac, or Washington Mutual shareholders would fare as poorly as they did. However, if you had owned one or even a few of those stocks as part of a well-diversified basket of high-quality stocks, you would have done just fine. I personally owned shares of AIG and Bear Stearns going into the crisis, but they made up just a small percentage of my portfolio, so while the crisis certainly wasn't fun for me, I wasn't nearly as devastated as many other investors. Here's the lesson: No matter how bulletproof any particular stock may seem, it isn't. Invest accordingly and don't put too much of your money in any one stock or sector.